This ultra flattering Tiffany quinceanera dress 26869 features a strapless sweetheart neckline, a structured corset bodice and a full tulle skirt. Gorgeous colorful appliques adorn this gown throughout adding charm while the glitter tulle skirt will have you sparkling with every move. 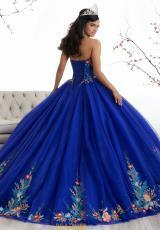 Find more stunning Tiffany quinceneara dresses at Peaches Boutique in Chicago.